Nothing says New Orleans comfort food like a big bowl of gumbo. Gumbo is the chicken soup of the south; it warms you up when it’s cold and puts the meat on your bones. It’s one of my favorite dishes to make because it is so easy to change up the flavors. Any good gumbo starts with the holy trinity: onions, celery, and bell peppers. These ingredients start to build rich and aromatic flavors in the stew. Now comes the best part: add any meat or seafood that sounds good to you. 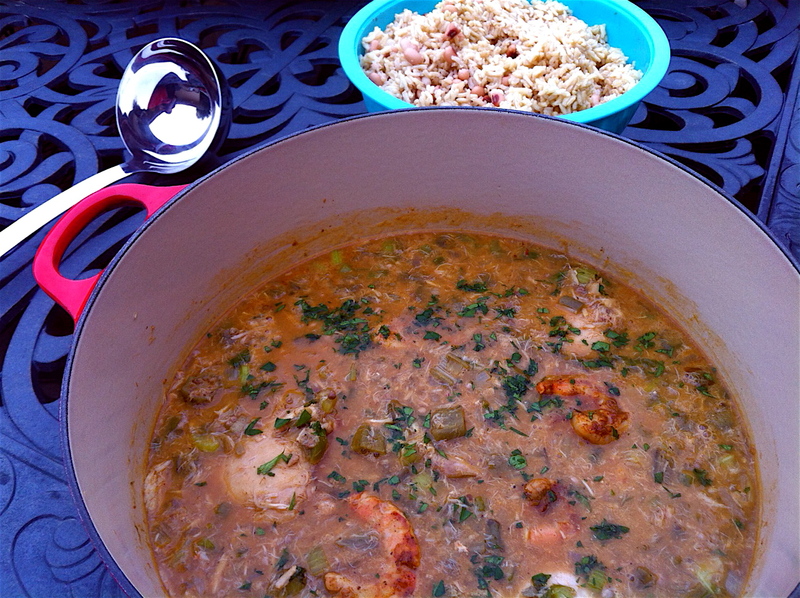 My Seafood Gumbo recipe today has shrimp, crab, and chicken in it. The more of a mixture of flavors the better. Everything will combine as it cooks to create a very flavorful dish. If this is starting to sound familiar, it is because gumbos and jambalayas have many of the same qualities. Here are the differences: gumbo has okra in it, where jambalaya doesn’t. People tend to disregard okra because it can have a slimy texture. Canned okra doesn’t really have those qualities, so don’t be afraid to add it in! It’s another vegetable in the mix and doesn’t have any unusual tastes. Another main difference between gumbo and jambalaya is that rice is cooked into the jambalaya, where it is served underneath a gumbo. You’ll notice that my recipe for Cajun Jambalaya isn’t served that way. I prefer to leave the rice on the side so that people can add as much or as little as they want. 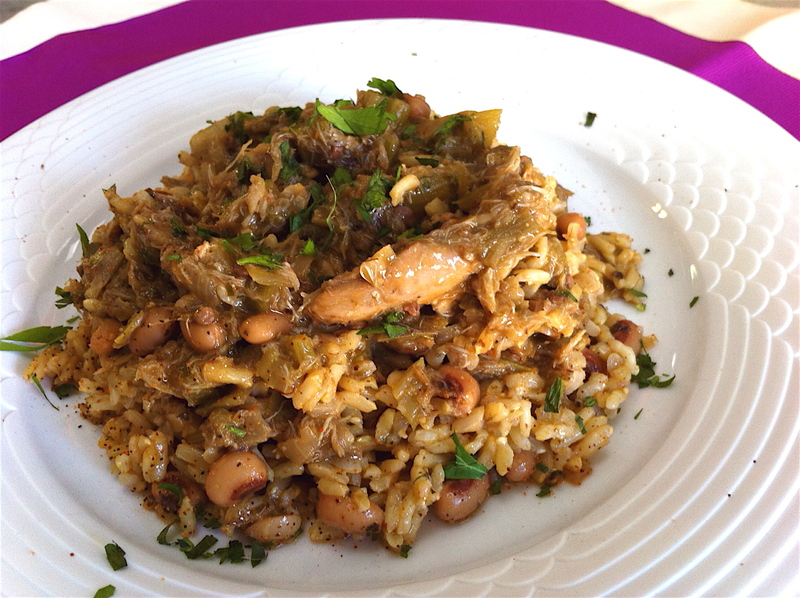 I’ve made an impromptu dirty rice for this recipe, adding black eyed peas to cooked brown rice. Dirty rice is traditionally made with sausage as well, but that seemed a little overkill with all of the other proteins in my Super Bowl menu. So this “dirty rice” is actually quite clean by New Orleans standards! Heat a large soup pot over medium heat with a drizzle of olive oil. Season the chicken thighs on both sides with the paprika, cayenne, garlic powder, onion powder, salt and pepper. Add the chicken to the pan and cook for roughly 3 minutes per side, until the chicken is brown. Remove the chicken from the pot and set aside. Add the shrimp to the pot and cook for 4 minutes total, cooking halfway through. Remove the shrimp and keep separate from the chicken. Add the onions, celery, peppers, and garlic to the pot. Cook for 5 minutes, or until the trinity begins to caramelize. Add the crab meat, sauteing just a few minutes cook it slightly. Start the roux by adding the butter to the pot. When it has melted, add the flour to the pot, whisking to combine it with the vegetables and butter. I suggest using the full 1/2 cup for a good, thick stew. Cook the flour and butter in the vegetables until it is a medium-dark brown. It will start to smell like toasted nuts. Add the wine to the pot and whisk well to combine. Add the chicken stock 1/2 cup at a time, whisking each amount in before adding the next. When all 48 oz have been added, add the chicken back to the pot. Bring the liquid to a boil and then reduce to a slow simmer. Cook the mixture for 40 minutes, or until the chicken is cooked through and is starting to fall off the bone. While the gumbo is cooking, bring the chicken stock and water to boil for the rice. Add the rice and reduce the heat to low, cooking for about 20 minutes, or according to package directions. In a separate pan, cook the onions, garlic, and black eyed peas with the Cajun seasoning. Fold into the rice when it has finished cooking and season to taste with salt and pepper. When the gumbo is nearly finished, add the shrimp back to into the pot. Cook for no more than 5 minutes before serving, as the shrimp will overcook and become tough. Season the gumbo with salt and pepper as desired. Serve each bowl of gumbo under a good scoop of rice and top with fresh parsley.